Romagna is a region where traditions are indeed hard to die. Thatʼs probably why in this north eastern italian region itʼs still customary to eat piadina romagnola in place of bread. In the XIX century Giovanni Pascoli, a well known poet from Romagna, described piadina as the “rough bread of Rome” in one of his poems. In fact the origins of piadina date back to the Roman days: just read the recipe and youʼll find yourselves flying two thousand years back in history. Melt the yeast (or baking soda) with the lukewarm milk and add the sugar or honey. On the pastry board that youʼll have already prepared mix the flour with all other ingredients and knead all till when you get a smooth dough that youʼll put to rest for one hour. 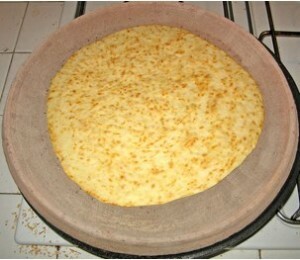 Now make by handlumps that youʼll flatten with a rolling pin to make a 25-30 cm diameter piece, half centimeter thick. Now your piadina is ready to be baked. In the older days piadina was baked on hot stones but today you can use either testo, i.e. the typical circular shaped terracotta to be heated up on fire. Testo is not easy to find anymore so you can replace it with a nonstick pan or casserole or cast iron plate. A little trick: spread the cooking surface with a small quantity of flour, just enough to make an almost unnoticeable layer; this will avoid that piadina sticks to the surface. During baking check that no bubble raises from your piadina; in case just poke it with a fork. Once baked youʼ l l rest piadina inside a straw basket and cover all with a cotton napkin. 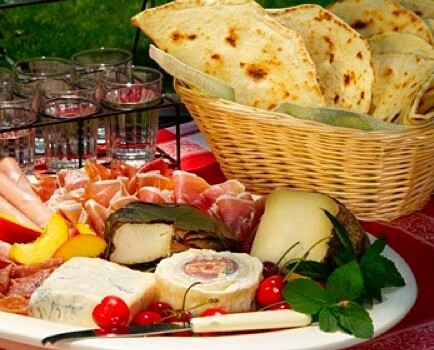 Piadina accompanies cold cuts, cheese, jam and anything else of your choice. A common way to prepare it is to cut piadina in two halves and put in between parma ham or any other cold cuts, rocket (arugula) and a thin layer of soft cheese: a couple of them with a glass of wine were the daily lunch for farmers and vineyard workers in the older days so you can recreate the same atmosphere today in no more than one hour and with few, simple ingredients easy to keep at home. Hence piadina with cold cuts can be an easy Sunday night dinner or a substantial snack to share with unexpected visiting friends.